The most extensive deep clouds in Earth’s climate system develop in the Tropical Western Pacific (TWP) during Northern Hemisphere winter. These clouds pack sufficient energy that, on occasion, they punch through the boundary that separates the lowest atmospheric layer (the troposphere) from the overlying stratosphere. As Earth warms, the intensity of tropical convection will increase. The TWP is the nexus between global warming and large-scale changes in atmospheric composition. Tropical convection rapidly transports air from just above the ocean surface to high altitudes. Scientists have long been interested in the vertical lofting of atmospheric gases produced by ocean organisms and the chemical fate of these compounds as they decompose in the upper troposphere and lower stratosphere. Convection together with chemical processing in the TWP controls the composition of the sub-tropical global troposphere as well as air that enters the lower stratosphere. CONvective TRansport of Active Species in the Tropics (CONTRAST) will quantify how convection redistributes atmospheric gases in the tropical atmosphere. Observations will be obtained by the NSF/NCAR HIAPER aircraft from a deployment in Guam during January and February 2014. HIAPER will conduct a series of flights dedicated to CONTRAST goals as well as a number of other flights conducted in concert with the high altitude NASA ATTREX Global Hawk (GH) aircraft and the low altitude British CAST BAe-146 aircraft. 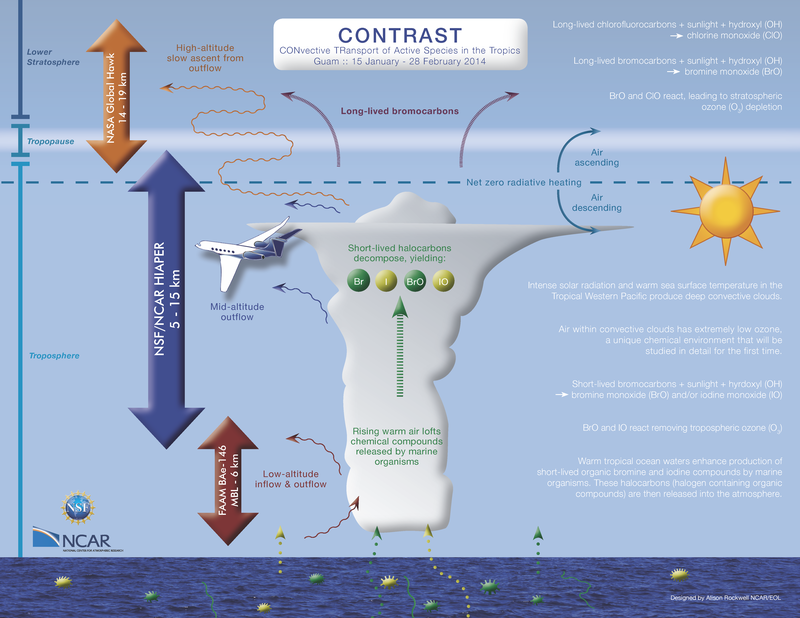 The BAe-146, HIAPER, and GH will together span the marine boundary layer to the tropical lower stratosphere, providing unprecedented detail on the composition of the tropical atmosphere.